Background and objectives Elevated concentrations of fibroblast growth factor 23 (FGF23) are postulated to promote 25-hydroxyvitamin D (25[OH]D) insufficiency in CKD by stimulating 24-hydroxylation of this metabolite, leading to its subsequent degradation; however, prospective human studies testing this relationship are lacking. Design, setting, participants, & measurements An open-label prospective study was conducted from October 2010 through July 2012 to compare the effect of 8 weeks of oral cholecalciferol therapy (50,000 IU twice weekly) on the production of 24,25(OH)2D3 in vitamin D–insufficient patients with CKD (n=15) and controls with normal kidney function (n=15). Vitamin D metabolites were comprehensively profiled at baseline and after treatment, along with FGF23 and other mineral metabolism parameters. Results Vitamin D3 and 25(OH)D3 concentrations increased equivalently in the CKD and control groups following cholecalciferol treatment (median D3 change, 8.6 ng/ml [interquartile range, 3.9–25.6 ng/ml] for controls versus 12.6 ng/ml [6.9–41.2 ng/ml] for CKD [P=0.15]; 25(OH)D3 change, 39.2 ng/ml [30.9–47.2 ng/ml] for controls versus 39.9 ng/ml [31.5–44.1 ng/ml] for CKD [P=0.58]). Likewise, the absolute increase in 1α,25(OH)2D3 was similar between CKD participants and controls (change, 111.2 pg/ml [64.3–141.6 pg/ml] for controls versus 101.1 pg/ml [74.2–123.1 pg/ml] for CKD; P=0.38). Baseline and post-treatment 24,25(OH)2D3 concentrations were lower in the CKD group; moreover, the absolute increase in 24,25(OH)2D3 after therapy was markedly smaller in patients with CKD (change, 2.8 ng/ml [2.3–3.5 ng/ml] for controls versus 1.2 ng/ml [0.6–1.9 ng/ml] for patients with CKD; P<0.001). Furthermore, higher baseline FGF23 concentrations were associated with smaller increments in 24,25(OH)2D3 for individuals with CKD; this association was negated after adjustment for eGFR by multivariate analysis. Conclusions Patients with CKD exhibit an altered ability to increase serum 24,25(OH)2D3 after cholecalciferol therapy, suggesting decreased 24-hydroxylase activity in CKD. The observed relationship between baseline FGF23 and increments in 24,25(OH)2D3 further refutes the idea that FGF23 directly contributes to 25(OH)D insufficiency in CKD through stimulation of 24-hydroxylase activity. Vitamin D is a secosteroid that is ingested through the diet as ergocalciferol (D2) or cholecalciferol (D3) or synthesized in skin (D3 only) from 7-dehydrocholesterol in response to sunlight exposure. Once in the circulation, vitamin D is metabolized in the liver by cytochrome P450(CYP)2R1 (25-hydroxylase) to form 25-hydroxyvitamin D (25[OH]D), the major metabolite used to determine clinical vitamin D status. A second hydroxylation step determines the ultimate fate of 25(OH)D, as 1α-hydroxylation by CYP27B1 yields 1α,25(OH)2D, a potent hormone that triggers vitamin D receptor–dependent pathways in target cells. Alternatively, both 25(OH)D and 1α,25(OH)2D can undergo 24-hydroxylation by CYP24A1 to generate 24,25(OH)2D and 1α,24,25(OH)3D, respectively (1). These 24-hydroxylated metabolites are primarily viewed as degradation products with little established physiologic activity. Both 1α-hydroxylation and 24-hydroxylation of 25(OH)D can occur in a multitude of tissues, with the kidneys being the major site (2,3). Patients with CKD exhibit a high prevalence of vitamin D insufficiency, accompanied by a complex pattern of mineral metabolism abnormalities; this includes a progressive rise in plasma concentrations of fibroblast growth factor 23 (FGF23) (4–6). FGF23 is a phosphaturic and vitamin D–regulatory hormone produced primarily by osteocytes; studies in animal models with normal kidney function suggest that FGF23 suppresses renal 1α-hydroxylase and stimulates 24-hydroxylase expression (7,8). Although multiple factors likely promote low plasma 25(OH)D concentrations in patients with CKD, it is speculated that increments in FGF23 contribute to this finding by diverting 25(OH)D to 24,25(OH)2D (9–11). In support of this theory, studies in rodent models of kidney disease demonstrate upregulation of the renal 24-hydroxylase gene (9,12,13); however, follow-up studies have revealed that serum 24,25(OH)2D concentrations are actually lower in CKD animals than in wild-type controls (13). Similarly, cross-sectional studies in humans suggest lower 24,25(OH)2D concentrations in patients with advanced CKD and a negative correlation with FGF23 concentrations (14–17). Thus, the effect of FGF23 on the generation of 24,25(OH)2D following vitamin D supplementation in humans with CKD remains undefined. To address this gap, we evaluated the formation of an extensive profile of vitamin D metabolites in response to high-dose cholecalciferol supplementation in patients with CKD compared with control individuals with normal kidney function and explored the relationship between serum FGF23 and vitamin D metabolite changes. Following protocol approval by the institutional review board at the University of Kansas Medical Center, participants were recruited from the medical center’s internal medicine clinics. Thirty patients exhibiting vitamin D insufficiency (15 with CKD and 15 controls) were enrolled between October 2010 and July 2012 following obtainment of written informed consent. Inclusion criteria for CKD participants included eGFR <45 ml/min per 1.73 m2, 25(OH)D <30 ng/ml, and parathyroid hormone >65 pg/ml. Inclusion criteria for the control group (non-CKD) included eGFR >60 ml/min per 1.73 m2 and 25(OH)D <30 ng/ml. Exclusion criteria were identical between groups and included active infection, recent hospitalization, prior organ transplantation, immunosuppression, active inflammatory disease (e.g., rheumatoid arthritis, systemic lupus erythematosus), cirrhosis, prior parathyroidectomy, active vitamin D therapy, and medical nonadherence. Kidney function was estimated via the CKD-Epidemiology Collaboration equation (18). This was an open-label, prospective, parallel study that was registered with clinicaltrials.gov in October 2010 (NCT01222234) and adhered to the Declaration of Helsinki. All study participants received oral cholecalciferol (Bio-Tech Pharmacal, Fayetteville, AR), 50,000 IU orally twice weekly for 8 weeks. Study participants discontinued all other vitamin D–containing supplements before study initiation and continued their normal diet. A parallel design for study enrollment was instituted to reduce between-group seasonal variation in study participation. Blood samples were collected immediately before treatment and within 1 week after cholecalciferol treatment; serum samples were stored at −80°C. Serum calcium and phosphorus were measured by a Unicel DxC800 system (Beckman Coulter), and intact parathyroid hormone (PTH) was measured by a Unicel DxI800 system (Beckman Coulter). FGF23 was measured by an intact-FGF23 ELISA (Kainos, Tokyo, Japan). The total (protein-bound+unbound) serum concentrations of D3, 25(OH)D3, 1α,25(OH)2D3, and 24,25(OH)2D3 were quantitated by ultra high performance liquid chromatography–tandem mass spectrometry (UHPLC-MS/MS). The method was developed and comprehensively validated according to the US Food and Drug Administration guidance on bioanalytical method validation (19). The UHPLC-MS/MS system consisted of an Accela autosampler, Accela UHPLC binary pump, and TSQ Quantum Ultra triple quadrupole mass spectrometer (Thermo, San Jose, CA). Briefly, 500-µl samples were precipitated with acetonitrile, extracted with methyl tert butyl ether, then derivatized with 4-phenyl-1,2,4-triazoline-3,5-dione. Derivatized vitamin D analytes were separated using a Waters Acquity BEH C18 column (150 mm×2.1 mm, 1.7-µm particles) by gradient elution with water and acetonitrile. The flow rate was 500 µl/min; total run time was 14 minutes. Analyte detection was achieved using positive atmospheric pressure chemical ionization and selected reaction monitoring. Standard curve ranges were 0.010–0.500 ng/ml (1α,25[OH]2D3), 0.100–15.0 ng/ml (D3 and 24,25[OH]2D3), and 1.00–100 ng/ml (25[OH]D3). Mean correlation coefficients were ≥0.994 for all calibration curves. The within-run and between-run accuracy and precision (percentage coefficient of variation) were ≤10.7% for all analytes. The ratio (in equivalent units) of each vitamin D metabolite to its precursor (metabolic ratio) was calculated to estimate the function of the corresponding enzyme responsible for its biochemical conversion. The metabolic ratio of 24,25(OH)2D3:25(OH)D3 was used to assess CYP24A1 activity, and the metabolic ratio of 1α,25(OH)2D3:25(OH)D3 was used to assess CYP27B1 activity. Determination of target sample size was based on an expected between-subject coefficient of variation for 25(OH)D of 30% following high-dose cholecalciferol treatment. Post-treatment 25(OH)D was used for power calculations because of a lack of published literature examining prospective changes in 24,25(OH)2D3 after high-dose cholecalciferol therapy. The sample size of n=15 individuals per group was estimated to have 90% power (two-sided α=0.05) to detect a 38% between-group difference in 25(OH)D and a 28% within-group difference in pre-treatment versus post-treatment 25(OH)D. Power calculations were performed using G*Power (version 3.0.10) (20). All data were confirmed to follow a Gaussian distribution using the Shapiro–Wilk normality test. Between- and within-group comparisons were evaluated by unpaired or paired two-sided t tests, as appropriate. The strength of the relationship between two variables was determined using linear regression, and the strength of the relationship between multiple variables was determined using multivariate regression analyses. Statistical calculations were performed using Prism 5.0b (GraphPad, San Diego, CA) and SPSS Statistics 21.0 for Macintosh (IBM, Armonk, NY). Data are presented as median (interquartile range [IQR]) or mean±SD unless otherwise specified. A P value <0.05 was considered to represent a statistically significant difference. Table 1 lists the baseline demographic characteristics for each group. We observed a relatively equal between-group distribution by race, season of study enrollment, and body mass index. The control group consisted of more women and was slightly younger. The mean eGFR was 102.2 ml/min per 1.73 m2 for controls and 30.5 ml/min per 1.73 m2 for the CKD group. Pre- and post-treatment mineral metabolism parameters are presented in Table 2. At baseline, the CKD group exhibited lower 1α,25(OH)2D3 and calcium levels and higher phosphorus, PTH, and FGF23 concentrations. Mean baseline 24,25(OH)2D3 was 36% lower in the CKD group than in the control group (P=0.09). We observed a significant rise in D3, 25(OH)D3, 1α,25(OH)2D3, and 24,25(OH)2D3 in both groups following cholecalciferol treatment. FGF23 concentrations increased modestly in both groups, with a slight decrease in PTH only in the CKD group. Calcium and phosphorus did not significantly change in either group after therapy. Of note, despite nearly identical post-treatment concentrations of 25(OH)D3 for both groups, the post-treatment 1α,25(OH)2D3 and 24,25(OH)2D3 values were 26% and 56% lower (P<0.05), respectively, in the CKD group (Table 2). Figure 1 depicts the pre- and post-treatment concentrations of vitamin D metabolites in individual study participants, as well as a between-group comparison of metabolite changes. The control group exhibited greater increments in 24,25(OH)2D3 with cholecalciferol therapy (median change, 2.8 ng/ml [IQR, 2.3–3.5 ng/ml] for controls versus 1.2 ng/ml [IQR, 0.6–1.9 ng/ml] for patients with CKD; P<0.001; Figure 1L), despite a similar rise in D3 (8.6 ng/ml [IQR, 3.9–25.6 ng/ml] for controls versus 12.6 ng/ml [IQR, 6.9–41.2 ng/ml] for patients with CKD; P=0.15; Figure 1C) and 25(OH)D3 (39.2 ng/ml [IQR, 30.9–47.2 ng/ml] for controls versus 39.9 ng/ml [IQR, 31.5–44.1 ng/ml] for patients with CKD; P=0.58; Figure 1F). The between-group change in 1α,25(OH)2D3 was also similar (111.2 pg/ml [IQR, 64.3–141.6 pg/ml] for controls versus 101.1 pg/ml [IQR, 74.2–123.1 pg/ml] for patients with CKD; P=0.38; Figure 1I). Vitamin D metabolite changes following cholecalciferol therapy. Pre- and post-treatment concentrations in individual study participants from the control group (first column) and CKD group (second column), along with a between-group comparison (far right column) of absolute changes for vitamin D3 (A–C), 25-hydroxyvitamin D3 (25[OH]D3) (D–F), 1α,25(OH)2D3 (G–I), and 24,25(OH)2D3 (J–L) (error bars represent mean±SD). Significant differences were observed in the calculated metabolic ratios between and within groups (Figure 2). The 1α,25(OH)2D3:25(OH)D3 and 24,25(OH)2D3:25(OH)D3 metabolic ratios were significantly lower in patients with CKD at baseline and after treatment (Figure 2, A–D), indicating that patients with CKD generated less 1α,25(OH)2D3 and 24,25(OH)2D3 per unit of substrate (25[OH]D3). Between-group comparison of the conversion of 25(OH)D3 to downstream metabolites. Pre- and post-treatment metabolic ratio comparison for 1α,25(OH)2D3: 25(OH)D3 (A and B) and 24,25(OH)2D3: 25(OH)D3 (C and D; error bars represent mean±SD). (E) Comparison of the relationship between the change in 1α,25(OH)2D3 versus change in 25(OH)D3 in CKD and control study participants (P=0.22 and P=0.51 for difference in slope and line elevation, respectively). (F) Comparison of the relationship between the change in 24,25(OH)2D3 versus change in 25(OH)D3 in CKD and control individuals (P=0.05 for difference in slopes; P<0.001 for difference in line elevation). To test whether baseline FGF23 concentrations predict the rise in 25(OH)D3 and its subsequent conversion to 1α,25(OH)2D3 or 24,25(OH)2D3 following cholecalciferol administration, we analyzed FGF23 concentrations as a function of the absolute change in these parameters (post-therapy minus pretherapy values) (Figure 3). We observed no association between baseline FGF23 concentrations and the change in 25(OH)D3 or 1α,25(OH)2D3 in either group (Figure 3, A–D). Likewise, no relationship was appreciated between FGF23 and 24,25(OH)2D3 changes in the control group (Figure 3E). We did, however, observe a significant inverse relationship between baseline FGF23 concentrations and 24,25(OH)2D3 changes in the CKD group (Figure 3F). Further analysis of this data using the change in FGF23 instead of baseline values yielded similar results (data not shown). Supplemental analyses testing the relationship between PTH and phosphorus versus 24,25(OH)2D3 changes revealed a positive association between PTH and 24,25(OH)2D3 in the control group and a nonsignificant inverse association in the CKD group (Supplemental Figure 1, A and B). 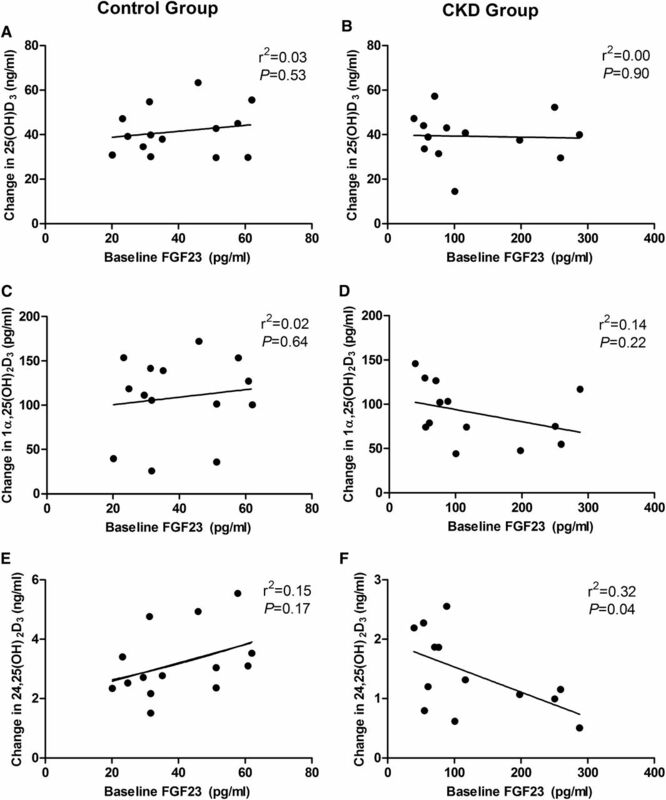 Relationship between change in vitamin D metabolite concentrations and baseline FGF23. Regression analyses depicting the relationship between pretreatment FGF23 concentrations and the absolute change in 25(OH)D3 (A and B), 1α,25(OH)2D3 (C and D), and 24,25(OH)2D3 (E and F) following cholecalciferol therapy in the control group (first column) and CKD group (second column). FGF23, fibroblast growth factor 23. To explore how decrements in kidney function may affect the conversion of 25(OH)D3 to downstream metabolites, we plotted the change in 1α,25(OH)2D3 and 24,25(OH)2D3 against eGFR (Figure 4, A and B). We identified a strong positive relationship between eGFR and change in 24,25(OH)2D3 (r2=0.62; P<0.001) (Figure 4B). Supplemental analyses investigating eGFR versus baseline and post-therapy 24,25(OH)2D3 demonstrated a similar strong positive association for only the post-therapy measurements (Supplemental Figure 2). In multivariate regression analysis exploring the individual influences of baseline FGF23 and eGFR on 24,25(OH)2D3 changes, FGF23 was no longer a significant predictor of the change in 24,25(OH)2D3; for every 1-pg/ml increase in baseline FGF23 the corresponding change in 24,25(OH)2D3 following cholecalciferol therapy was 0.002 ng/ml less (β=−0.12; P=0.44). Conversely, eGFR remained a strong predictor; for every 1-ml/min per 1.73 m2 decrease in eGFR the corresponding change in 24,25(OH)2D3 was 0.023 ng/ml less (β=0.71; P<0.001) (model-adjusted r2=0.59; P<0.001). Additional diagnostics revealed no obvious collinearity among independent variables (variance inflation factor=1.5). Relationship between change in vitamin D metabolites and eGFR. Regression analysis depicting the relationship between eGFR and the absolute change in 1α,25(OH)2D3 (A) and 24,25(OH)2D3 (B) for all study participants (control and CKD groups combined). Vitamin D insufficiency is prevalent in patients with CKD and is believed to contribute to an abundance of adverse clinical outcomes in this group (21–25). Although the cause of low 25(OH)D and 1α,25(OH)2D concentrations in CKD is likely multifactorial, it is postulated that FGF23 contributes to this clinical entity through its stimulation of renal 24-hydroxlase activity (11). However, no clinical trials have prospectively tested this hypothesis. Furthermore, cross-sectional data from humans and rodent models of CKD suggest that 24,25(OH)2D concentrations are lower in the setting of impaired kidney function (13,15–17,26). Given the apparent disparity between these clinical observations and current theories regarding vitamin D metabolism in CKD, further in vivo investigation of the 24-hydroxylase pathway can provide valuable insight into the pathophysiology of mineral metabolism derangements in CKD. In the current study, we prospectively evaluated the generation of 24,25(OH)2D3 and the effect of serum FGF23 concentrations on 24,25(OH)2D3 changes in patients with CKD and control patients following cholecalciferol therapy. Similar to prior cross-sectional studies in CKD cohorts (15,16,26,27), our investigation demonstrated lower baseline 24,25(OH)2D3 concentrations in patients with CKD, as well as a positive correlation between eGFR and baseline 24,25(OH)2D3 concentrations (Supplemental Figure 2). The lack of statistical significance between baseline 24,25(OH)2D3 concentrations in the CKD and control groups was not unexpected because our power calculations were based on the anticipated variability in post-treatment 25(OH)D3 concentrations and not differences in baseline 24,25(OH)2D3 concentrations. We found that baseline D3 and 25(OH)D3 concentrations were similar between the CKD and control groups, while 1,25(OH)2D3 concentrations were lower in patients with CKD (Table 2). Baseline serum D3 concentrations were extremely low or undetectable for most patients, a finding previously reported in other vitamin D–insufficient cohorts (28). In addition, the mean 1,25(OH)2D3 concentration for controls was 96.9 pg/ml. While this value is near the upper end of traditional reference ranges and seems higher than expected for a population with vitamin D insufficiency, it is well documented that 1,25(OH)2D3 concentrations may be normal or even elevated in the setting of low 25(OH)D3 concentrations (29,30). In contrast to prior work in experimental models of advanced kidney disease (31), we observed a similar rise in 25(OH)D concentrations in both groups (Figure 1F) following cholecalciferol therapy. Concentrations of 1α,25(OH)2D3 remained lower in the CKD group after therapy (Table 2), and although the absolute change in 1α,25(OH)2D3 from baseline was slightly less than that observed in controls, this difference was not statistically significant (Figure 1I). On the other hand, the change in 24,25(OH)2D3 concentrations was dramatically less in the CKD group after cholecalciferol therapy (Figure 1L), implying either reduced 24-hydroxylase activity or shunting of 25(OH)D to alternative metabolic pathways in CKD. The observation that lower 24,25(OH)2D3 concentrations in patients with CKD were not accompanied by higher 25(OH)D concentrations in these individuals may support the latter scenario. Of note, the hepatic CYP3A4 enzyme was recently identified to generate several novel metabolites from 25(OH)D, including 4β,25(OH)2D3 (32). The clinical significance of these novel metabolites remains unclear. To further explore the inherent differences in 1α-hydroxylase and 24-hydroxylase activities in CKD, we calculated metabolic ratios of 1α,25(OH)2D3 and 24,25(OH)2D3 to 25(OH)D (Figure 2). Metabolic ratios are commonly used in clinical pharmacology to estimate the ability of an enzyme to convert a substrate to its metabolite (33) but have been rarely used in studies of vitamin D metabolism (34–36). The 1α,25(OH)2D3:25(OH)D3 and 24,25(OH)2D3:25(OH)D3 metabolic ratios were markedly lower in patients with CKD both at baseline and after therapy (Figure 2, A–D). Stated differently, individuals with CKD produce less 1α,25(OH)2D3 and 24,25(OH)2D3 per incremental rise in 25(OH)D compared with patients with normal kidney function. This difference is especially pronounced for 24,25(OH)2D3, as evidenced by plotting the change in 25(OH)D3 against the change in 24,25(OH)2D3 (Figure 2F). It remains unclear whether these observations result from suppression of 1α-hydroxylase and 24-hydroxylase enzyme activity, or irreversible loss of renal enzyme expression in tubular epithelial cells. 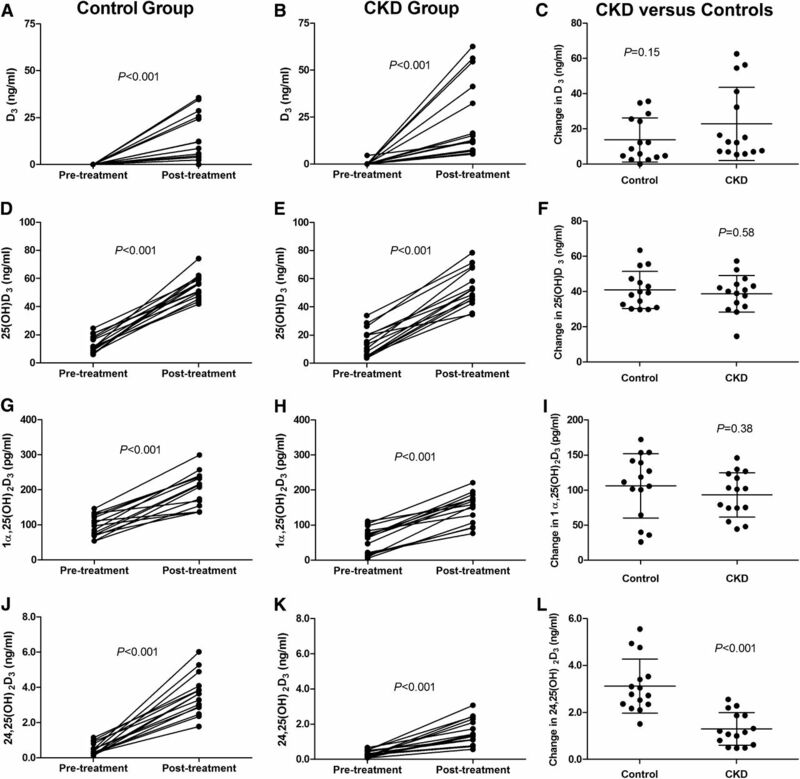 On the basis of our prior studies demonstrating a dramatic rise in serum 1α,25(OH)2D concentrations in response to phosphate restriction in rodents with CKD (12), we predict that a suppression of enzyme activity is primarily responsible for decreased metabolite production in CKD individuals. Because parathyroid hormone has purported effects to promote the destabilization and degradation of 24-hydroxylase (CYP24A1) mRNA (37), it is plausible that increments in parathyroid hormone might inhibit the translation of 24-hydroxylase mRNA signals in CKD, although supplemental analyses in our study suggested no obvious correlation between parathyroid hormone and increments in 24,25(OH)2D3 in patients with CKD (Supplemental Figure 1). Likewise, the increased renal expression of 24-hydroxylase mRNA observed in CKD rodent models would contradict a potential role of parathyroid hormone to stimulate 24-hydroxylase mRNA degradation in this setting (12,13). To expand on prior observations by Bosworth et al. that suggested no association between cross-sectional FGF23 and 24,25(OH)2D3 concentrations (16), we investigated the relationship between baseline FGF23 and prospective changes in vitamin D metabolites following cholecalciferol treatment. Despite baseline FGF23 concentrations that were approximately 4-fold higher in the CKD group (Table 2), we observed no relationship between baseline FGF23 and the change in 25(OH)D or 1α,25(OH)2D3 in either group (Figure 3, A–D). However, we found a significant inverse relationship between baseline FGF23 and the change in 24,25(OH)2D3 in the CKD group only (Figure 3F). This finding is particularly interesting given the proposed action of FGF23 to stimulate renal 24-hydroxylase activity, which contradicts our findings. On the basis of published data suggesting renal α-Klotho, an obligate FGF23 coreceptor, is markedly reduced in CKD (38), it is plausible that the inability of FGF23 to stimulate 24-hydroxylase activity in this setting results from resistance to FGF23. Because FGF23 concentrations are higher in more advanced stages of CKD, it is possible that the inverse relationship between FGF23 and 24,25(OH)2D3 changes simply represents declining 24-hydroxylase function with nephron loss. In fact, in a pooled analysis of all study participants, we observed a highly significant relationship between baseline eGFR and the change in 24,25(OH)2D3 (Figure 4B). Further multivariate analysis testing the effect of eGFR on the relationship between FGF23 and 24,25(OH)2D3 revealed that FGF23 no longer predicted 24,25(OH)2D3 changes when accounting for eGFR. We recognize that our study has several limitations. First, our suggestion that lower quantities of 1α,25(OH)2D3 and 24,25(OH)2D3 represent decreased production of these metabolites in CKD is based on the premise that circulating levels of these compounds (1) are primarily of renal origin and (2) are determined primarily by rates of synthesis, not degradation or deposition in extravascular sites. It remains possible that nonrenal systems may be involved in this response to vitamin D therapy (2), as suggested by prior studies showing that anephric pigs retain the ability to generate 24,25(OH)2D3 in response to cholecalciferol (39). Second, the use of metabolic ratios to assess in vivo 1α-hydroxylase and 24-hydroxylase activity is a newer concept that needs further validation. Third, it is difficult to establish cause-effect relationships regarding the effects of FGF23 on vitamin D metabolism based solely on associative analyses. The current study advances our understanding of the effect of CKD on vitamin D metabolism and the role of FGF23 in the response to vitamin D supplementation. 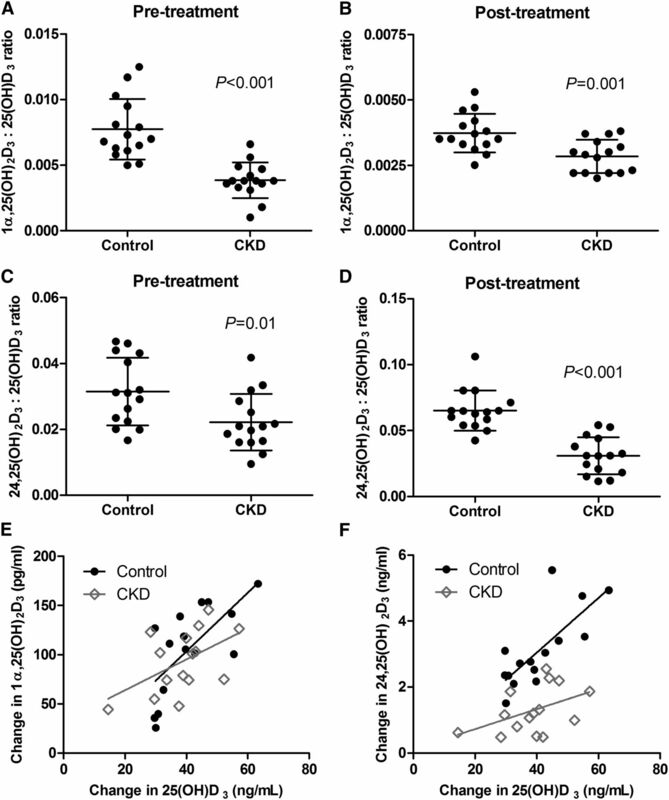 More specifically, we demonstrated that patients with CKD exhibit lower serum 24,25(OH)2D3 concentrations than controls in response to an equal dose of cholecalciferol and an equivalent rise in the 25(OH)D3 substrate, suggesting considerably altered 24-hydroxylase regulation in patients with reduced kidney function. Moreover, the inverse relationship between FGF23 and the change in 24,25(OH)2D3 in response to cholecalciferol therapy provides strong evidence against a role of FGF23 as a promoter of 25(OH)D insufficiency in this setting. This work was supported by a Mentored Clinical Scientist Grant from the Office of Scholarly, Academic & Research Mentoring and the Kansas University Medical Center Department of Internal Medicine (J.R.S. ), and grant DK054171 from the National Institutes of Health (P.A.F.). This article contains supplemental material online at http://cjasn.asnjournals.org/lookup/suppl/doi:10.2215/CJN.03130314/-/DCSupplemental.